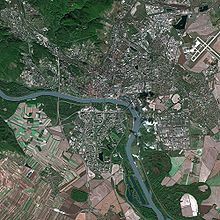 Satellite imagery (also Earth observation imagery or spaceborne photography) are images of Earth or other planets collected by imaging satellites operated by governments and businesses around the world. Satellite imaging companies sell images by licensing them to governments and businesses such as Apple Maps and Google Maps. The satellite images were made from pixels. The first crude image taken by the satellite Explorer 6 shows a sunlit area of the Central Pacific Ocean and its cloud cover. The photo was taken when the satellite was about 17,000 mi (27,000 km) above the surface of the earth on August 14, 1959. At the time, the satellite was crossing Mexico. The first images from space were taken on sub-orbital flights. 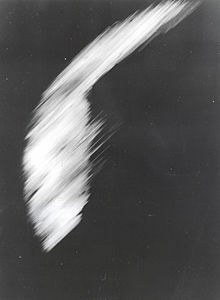 The U.S-launched V-2 flight on October 24, 1946 took one image every 1.5 seconds. With an apogee of 65 miles (105 km), these photos were from five times higher than the previous record, the 13.7 miles (22 km) by the Explorer II balloon mission in 1935. 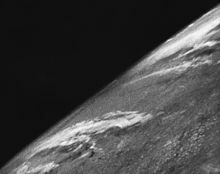 The first satellite (orbital) photographs of Earth were made on August 14, 1959 by the U.S. Explorer 6. The first satellite photographs of the Moon might have been made on October 6, 1959 by the Soviet satellite Luna 3, on a mission to photograph the far side of the Moon. 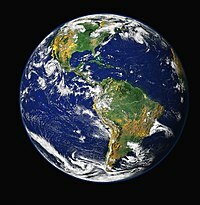 The Blue Marble photograph was taken from space in 1972, and has become very popular in the media and among the public. Also in 1972 the United States started the Landsat program, the largest program for acquisition of imagery of Earth from space. Landsat Data Continuity Mission, the most recent Landsat satellite, was launched on 11 February 2013. In 1977, the first real time satellite imagery was acquired by the United States's KH-11 satellite system. 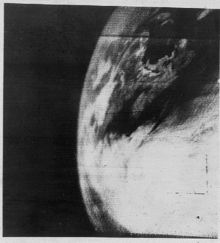 The first television image of Earth from space transmitted by the TIROS-1 weather satellite in 1960. Satellite images have many applications in meteorology, oceanography, fishing, agriculture, biodiversity conservation, forestry, landscape, geology, cartography, regional planning, education, intelligence and warfare. Images can be in visible colors and in other spectra. There are also elevation maps, usually made by radar images. Interpretation and analysis of satellite imagery is conducted using specialized remote sensing software. Radiometric resolution is defined as the ability of an imaging system to record many levels of brightness (contrast for example) and to the effective bit-depth of the sensor (number of grayscale levels) and is typically expressed as 8-bit (0-255), 11-bit (0-2047), 12-bit (0-4095) or 16-bit (0-65,535). Geometric resolution refers to the satellite sensor's ability to effectively image a portion of the Earth's surface in a single pixel and is typically expressed in terms of Ground sample distance, or GSD. GSD is a term containing the overall optical and systemic noise sources and is useful for comparing how well one sensor can "see" an object on the ground within a single pixel. For example, the GSD of Landsat is ≈30m, which means the smallest unit that maps to a single pixel within an image is ≈30m x 30m. The latest commercial satellite (GeoEye 1) has a GSD of 0.41 m. This compares to a 0.3 m resolution obtained by some early military film based Reconnaissance satellite such as Corona. The resolution of satellite images varies depending on the instrument used and the altitude of the satellite's orbit. For example, the Landsat archive offers repeated imagery at 30 meter resolution for the planet, but most of it has not been processed from the raw data. Landsat 7 has an average return period of 16 days. For many smaller areas, images with resolution as high as 41 cm can be available. Satellite imagery is sometimes supplemented with aerial photography, which has higher resolution, but is more expensive per square meter. Satellite imagery can be combined with vector or raster data in a GIS provided that the imagery has been spatially rectified so that it will properly align with other data sets. Satellite imaging of the Earth surface is of sufficient public utility that many countries maintain satellite imaging programs. The United States has led the way in making these data freely available for scientific use. Some of the more popular programs are listed below, recently followed by the European Union's Sentinel constellation. Landsat is the oldest continuous Earth observing satellite imaging program. Optical Landsat imagery has been collected at 30 m resolution since the early 1980s. Beginning with Landsat 5, thermal infrared imagery was also collected (at coarser spatial resolution than the optical data). The Landsat 7 and Landsat 8 satellites are currently in orbit. Landsat 9 is planned. MODIS has collected near-daily satellite imagery of the earth in 36 spectral bands since 2000. MODIS is onboard the NASA Terra and Aqua satellites. The ESA is currently developing the Sentinel constellation of satellites. Currently, 7 missions are planned, each for a different application. Sentinel-1 (SAR imaging), Sentinel-2 (decameter optical imaging for land surfaces), and Sentinel-3 (hectometer optical and thermal imaging for land and water) have already been launched. The Meteosat-2 geostationary weather satellite began operationally to supply imagery data on 16 August 1981. 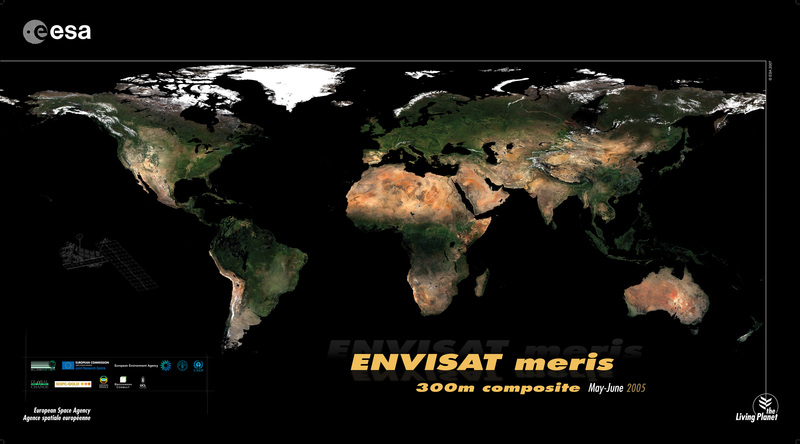 Eumetsat has operated the Meteosats since 1987. The Meteosat visible and infrared imager (MVIRI), three-channel imager: visible, infrared and water vapour; It operates on the first generation Meteosat, Meteosat-7 being still active. The 12-channel Spinning Enhanced Visible and Infrared Imager (SEVIRI) includes similar channels to those used by MVIRI, providing continuity in climate data over three decades; Meteosat Second Generation (MSG). The Flexible Combined Imager (FCI) on Meteosat Third Generation (MTG) will also include similar channels, meaning that all three generations will have provided over 60 years of climate data. GeoEye's GeoEye-1 satellite was launched on September 6, 2008. The GeoEye-1 satellite has the high resolution imaging system and is able to collect images with a ground resolution of 0.41 meters (16 inches) in the panchromatic or black and white mode. It collects multispectral or color imagery at 1.65-meter resolution or about 64 inches. The 3 SPOT satellites in orbit (Spot 2, 4 and 5) provide images with a large choice of resolutions – from 2.5 m to 1 km. Spot Image also distributes multiresolution data from other optical satellites, in particular from Formosat-2 (Taiwan) and Kompsat-2 (South Korea) and from radar satellites (TerraSar-X, ERS, Envisat, Radarsat). Spot Image is also the exclusive distributor of data from the high resolution Pleiades satellites with a resolution of 0.50 meter or about 20 inches. The launches occurred in 2011 and 2012, respectively. The company also offers infrastructures for receiving and processing, as well as added value options. BlackBridge, previously known as RapidEye, operates a constellation of five satellites, launched in August 2008, the RapidEye constellation contains identical multispectral sensors which are equally calibrated. Therefore, an image from one satellite will be equivalent to an image from any of the other four, allowing for a large amount of imagery to be collected (4 million km² per day), and daily revisit to an area. Each travel on the same orbital plane at 630 km, and deliver images in 5 meter pixel size. 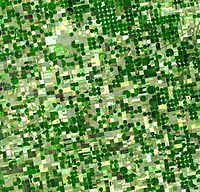 RapidEye satellite imagery is especially suited for agricultural, environmental, cartographic and disaster management applications. The company not only offers their imagery, but consults their customers to create services and solutions based on analysis of this imagery . Earth Resource Observation Satellites, better known as “EROS” satellites, are lightweight, low earth orbiting, high-resolution satellites designed for fast maneuvering between imaging targets. In the commercial high-resolution satellite market, EROS is the smallest very high resolution satellite; it is very agile and thus enables very high performances. The satellites are deployed in a circular sun-synchronous near polar orbit at an altitude of 510 km (+/- 40 km). EROS satellites imagery applications are primarily for intelligence, homeland security and national development purposes but also employed in a wide range of civilian applications, including: mapping, border control, infrastructure planning, agricultural monitoring, environmental monitoring, disaster response, training and simulations, etc. EROS A – a high resolution satellite with 1.9-1.2m resolution panchromatic was launched on December 5, 2000. EROS B - the second generation of Very High Resolution satellites with 70 cm resolution panchromatic, was launched on April 25, 2006. Advancements in artificial intelligence have made autonomous, large scale analysis of imagery possible. AI has been taught to process Satellite Imagery with a small degree of error. Studies have used AI to differentiate between different forest types and AI can tell the difference between certain soil and vegetation types. Researchers are using AI to monitor Satellite Imagery for vineyard and grape health as well as having AI estimate wheat harvest size. Projects like SpaceKnow uses AI to conduct case studies in near real-time of deforestation due to wildfires in California and manufacturing activity in China. As the technology advances, clearer imagery and faster neural networks has allowed for the study of Above Ground Biomass (AGB). This ABG index can describe the size and density of vegetation which scientists use to estimate carbon output and footprints in certain areas. Scientists are eager to apply this data to the study of global warming and climate change. Researchers are developing AI that can monitor refugee movements in war-torn countries, monitor deforestation in the Amazon rain-forest, and show algae blooms in places like the Gulf of Mexico and the Red Sea. Upcoming studies of contaminated surface water and chemical runoff from Fracking are also being planned. Because the total area of the land on Earth is so large and because resolution is relatively high, satellite databases are huge and image processing (creating useful images from the raw data) is time-consuming. Preprocessing, such as image destriping is often required. Depending on the sensor used, weather conditions can affect image quality: for example, it is difficult to obtain images for areas of frequent cloud cover such as mountain-tops. For such reasons, publicly available satellite image datasets are typically processed for visual or scientific commercial use by third parties. Commercial satellite companies do not place their imagery into the public domain and do not sell their imagery; instead, one must be licensed to use their imagery. Thus, the ability to legally make derivative products from commercial satellite imagery is minimized. Privacy concerns have been brought up by some who wish not to have their property shown from above. Google Maps responds to such concerns in their FAQ with the following statement: "We understand your privacy concerns... The images that Google Maps displays are no different from what can be seen by anyone who flies over or drives by a specific geographic location." ^ "50 years of Earth Observation". 2007: A Space Jubilee. European Space Agency. October 3, 2007. Retrieved 2008-03-20. ^ "First Picture from Explorer VI Satellite". NASA. Archived from the original on 2009-11-30. ^ grayaudio on Mar 15, 2010. "World's Highest-Resolution Satellite Imagery". HotHardware. Retrieved 2013-06-09. ^ "ASTER Project". Retrieved 2015-04-06. ^ Shall, Andrea (September 6, 2008). "GeoEye launches high-resolution satellite". Reuters. Retrieved 2008-11-07. ^ "Ball Aerospace & Technologies Corp". Retrieved 2008-11-07. ^ "High Resolution Aerial Satellite Images & Photos". Retrieved 2014-10-24. ^ "RapidEye Press Release" (PDF). Retrieved 2013-06-09. ^ McGovern, Eugene A.; Holden, Nicholas M.; Ward, Shane M.; Collins, James F. (January 2000). "Remotely sensed satellite imagery as an information source for industrial peatlands management". Resources, Conservation and Recycling. 28 (1–2): 67–83. doi:10.1016/s0921-3449(99)00034-8. ISSN 0921-3449. ^ Friedel, Michael J.; Buscema, Massimo; Vicente, Luiz Eduardo; Iwashita, Fabio; Koga-Vicente, Andréa (2017-07-11). "Mapping fractional landscape soils and vegetation components from Hyperion satellite imagery using an unsupervised machine-learning workflow". International Journal of Digital Earth. 11 (7): 670–690. doi:10.1080/17538947.2017.1349841. ISSN 1753-8947. ^ Pantazi, X.E. ; Moshou, D.; Alexandridis, T.; Whetton, R.L. ; Mouazen, A.M. (February 2016). "Wheat yield prediction using machine learning and advanced sensing techniques". Computers and Electronics in Agriculture. 121: 57–65. doi:10.1016/j.compag.2015.11.018. ISSN 0168-1699. ^ "Welcome | SpaceKnow". www.spaceknow.com. Retrieved 2019-02-25. ^ Deb, Dibyendu; Singh, J. P.; Deb, Shovik; Datta, Debajit; Ghosh, Arunava; Chaurasia, R. S. (2017-10-20). "An alternative approach for estimating above ground biomass using Resourcesat-2 satellite data and artificial neural network in Bundelkhand region of India". Environmental Monitoring and Assessment. 189 (11). doi:10.1007/s10661-017-6307-6. ISSN 0167-6369. PMID 29052047. Wikimedia Commons has media related to Satellite imagery.